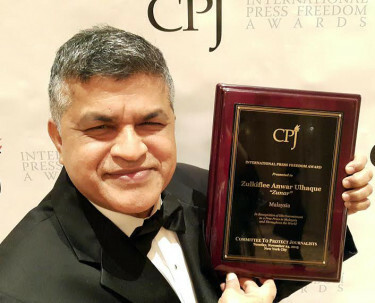 Malaysian political cartoonist Zunar, who is currently facing a possible 43-year jail sentence on charges brought under Malaysia’s Sedition Act, was presented the International Press Freedom Award from the Committee to Protect Journalists at a gala event in New York City on November 24. I’m so happy to be here tonight to accept this and not in a jail somewhere in Malaysia. I would like to dedicate this award to the Malaysians who have equally pushed for reform. It is both my responsibility and my right as a citizen to expose corruption, wrongdoing and injustices. Laws like the Sedition Act mean that drawing cartoons is a crime since the Sedition Act is a criminal act. The government of Malaysia is a cartoon government; a government of the cartoon, by the cartoon, for the cartoon — sorry Abraham Lincoln. For asking people to laugh at the government, I was handcuffed, detained, thrown into the lock up. But I kept laughing and encouraging people to laugh with me. Why? Because laughter is the best form of protest. My mission is to fight through cartoon. Why pinch when you can punch? People need to know the truth and I will continue to fight through my cartoons. I want to give a clear message to the aggressors — they can ban my cartoons, they can ban my books, but they cannot ban my mind. Also receiving CPJ International Press Freedom Awards were Cándido Figueredo Ruíz of Paraguay, Syrian citizen journalist collective Raqqa is Being Slaughtered Silently, and Zone 9 bloggers of Ethiopia https://www.cpj.org/awards/2015/zone-9-bloggers-ethiopia.php. Zunar’s next court appearance regarding the sedition charges is scheduled for December 8.